A dear friend of mine is getting married and asked if I would make her invitations! I was thrilled to be asked! And so excited for her too! 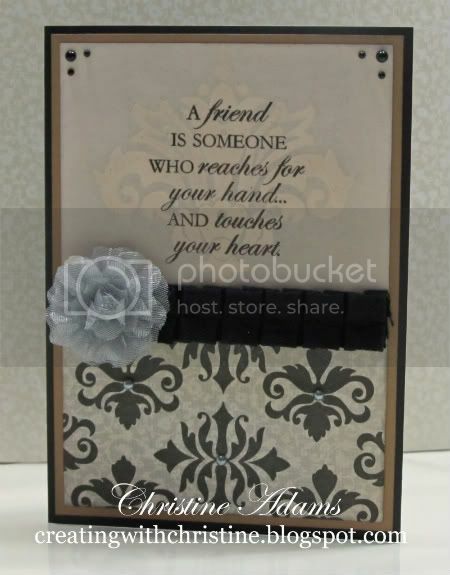 My inspiration came from Tracey Mason's card she made using Bliss and our February Stamp of the Month - Friendship. Here is the card that I made in February. So when my friend asked me about her wedding invites, I immediately thought of this card. So I made a few subtle changes and here is what I came up with. I used the Friendship stamp set along with the Bliss WOTG stamp set. (The inside information is printed in the same fonts as the front, I just didn't think I should show her personal info.) I started by printing the personalized sentiment on Colonial White cardstock. Then I stamped the couple holding hands using Versamark ink, sprinked with Clear Embossing Powder, then heat set with a craft heater. Then I sponged black ink in a circular motion over the couple. 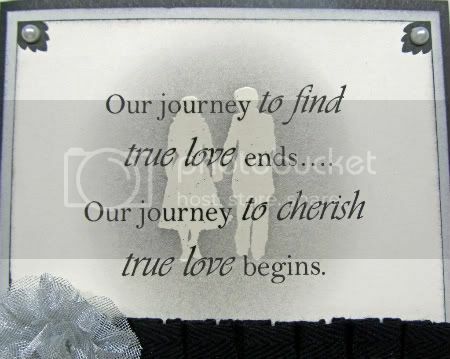 The ink will resist the embossed couple. Cool huh? I also used our trendy black pleated ribbon from our Wings L2 Assortment pack (Z1398), some Pearl Opaques (Z1336), and the beautiful silver mesh flowers from our Bliss L2 Assortment pack (Z1355). Totally beautiful & I absolutely love the sentiment! 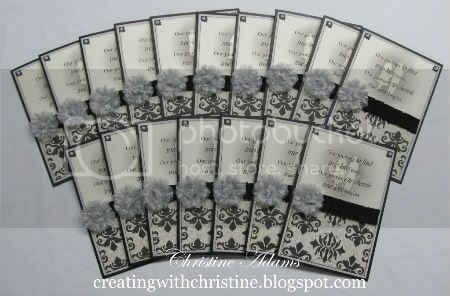 I agree with Sheila, the invitations are BEAUTIFUL!!! Great job!!! I am so blessed to have the opportunity to stay home and have a home based business as an independent consultant for Close to my Heart, an innovative leader in the stamping and scrapbooking industry! And equally blessed to have a wonderful, creative team of friends and consultants! 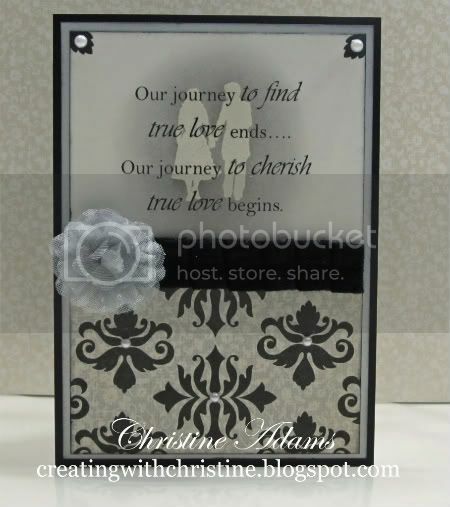 If you'd like to join my team or learn more about scrapbooking and stamping, visit my website at: christineadams.ctmh.com or contact me for more information at christine@creatingwithchristine.com. Sign Up for Blog Updates via Email! Click on the CHIMP to sign up! I've earned 3 trips so far! Get everything you need to start your business or hobby with this kit (valued at over $200) for only $75! Start your business on the weekend and be profitable by NEXT WEEK! Click on the image above or contact me for more information! Click on the photo to check out our latest Idea Books! Click here for even MORE inspiration! Why I LOVE my job!